So today is our 5 year Wedding Anniversary. 5 years have flown by. 5 years ago we lived in a 1 bedroom apartment had 1 dog. Since then we bought and sold a house and moved to a whole new state. Big changes that I hope to continue for the best over the next 5 years. I love my husband with my whole heart and I could not imagine my life without him. He is my rock and even deals with my HORRIBLE car singing! LOL. 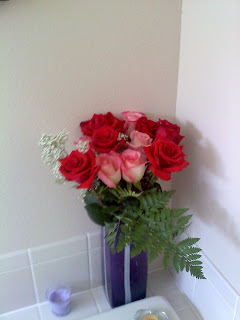 We agreed to no gifts this year since things are tight but he still surprised me with roses! I love the multi-colored pink ones. Happy 5 years I love you! Those are beautiful- happy anniversary!! :) I hope this next year is the best one yet! What lovely flowers! Happy, happy anniversary! We did "no gifts" this year and it was great.